Germany is one of the most important players on the burgeoning international blockchain scene. German developers, startups, and more established companies are working with international investors and collaborators to find exciting new use cases for the encryption technology. The hype around blockchain and its association with controversial cryptocurrencies like bitcoin has alarmed financial markets in recent years. But attitudes towards the technology, which enables the authentication of transactions without them needing to be administered or guaranteed by a central authority, are changing. Bankers, company executives, legal counsels, and politicians are now embracing its transformative potential for global industry. Blockchain is a decentralized, data-sharing technology that functions as a public ledger for storing and linking transactions or processes. The encrypted data blocks are stored on a large number of computers worldwide, which makes them virtually impossible to manipulate or hack. 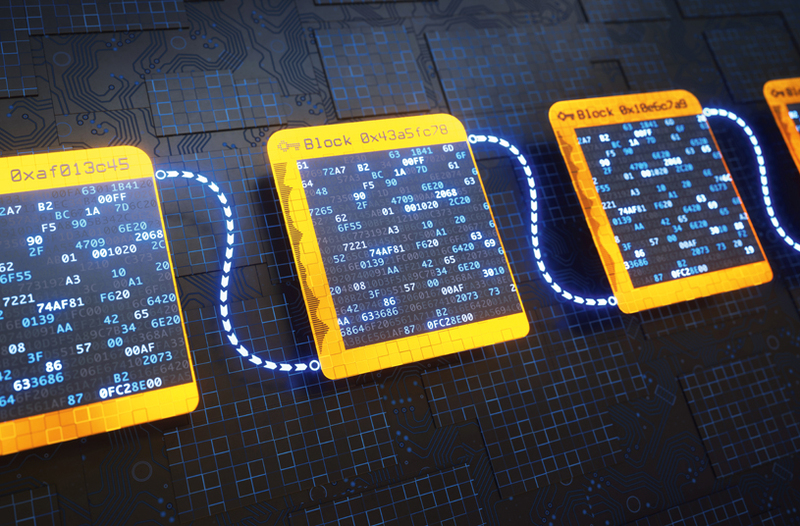 Blockchain was invented in 2008 by a person (or group of people) calling themselves Satoshi Nakamoto to serve as the public transaction ledger of the cryptocurrency bitcoin. But as Stephan Noller, VP of the German Digital Association for the Digital Economy (BVDW), says, “What’s known as blockchain is actually a technology that can do much, much more than create virtual currencies. In fact, it can help solve many of the challenges of the digital economy.” Quite simply, it could provide the infrastructure for a new kind of internet: a chain of decentralized data networks made up of multiple nodes (participants) within which transactions can be openly shared and updated, and which, critically, is virtually impossible to manipulate or hack. Berlin has been described by Joseph Lubin, co-founder of the Ethereum Foundation, which brings together established companies and blockchain developers, as “the most important city in the blockchain cosmos.” For many years there has been a thriving scene in the city, which is home to many renowned software developers and IT experts who deal with cryptographic encryption technologies. “Blockchain builds on these technologies,” says Rohr. Berlin’s developers recognized the potential of the technology early on and began to design creative applications to develop it further, attracting other developers and entrepreneurs from around the world. More recently, large international corporations have arrived and hired local blockchain specialists to compete in this growing market. Figure raised by the blockchain company Block.One from investors for an Initial Coin Offering (ICO) in June 2018. Some of the best-known international blockchain projects, such as Ethereum and the IOTA Foundation, which works on a faster and more efficient variant of blockchain technologies, have development centers in Germany and now set the pace worldwide in terms of blockchain innovations. “Many German and foreign companies and investors from a wide range of industries have now recognized the potential and are working together with crypto startups and developers on joint projects,” says Rohr. Companies and investors are primarily interested in three characteristics of the technology. The first is decentralized data storage: blockchains function as “distributed ledger technologies,” where data is packed into linked blocks, encrypted, and stored worldwide on a large number of computers. On the one hand, a widely-distributed infrastructure makes data storage more complex and slower than in traditional, centralized database systems. 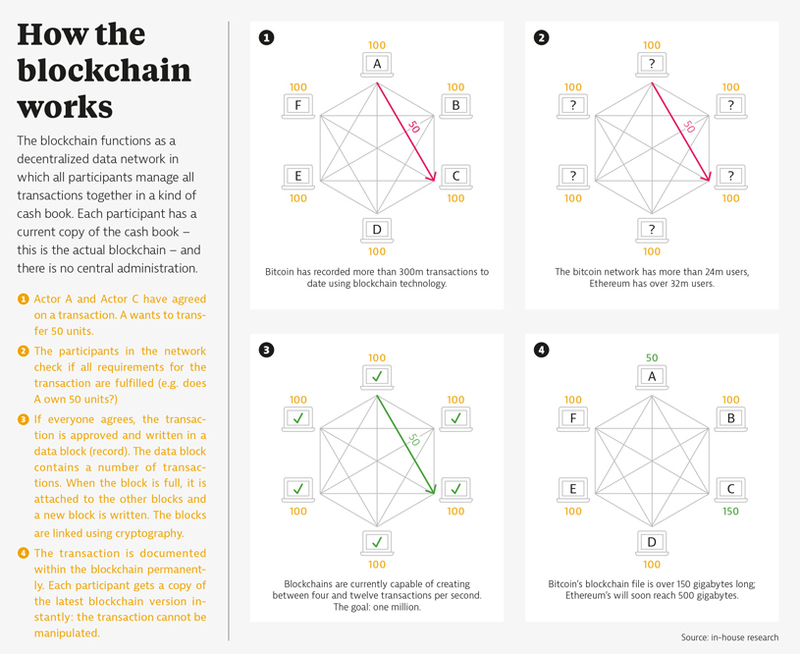 But on the other, the infrastructure has a decisive advantage: the immutability of the collated data – blockchain’s second key characteristic. The blockchain acts as a kind of digital notary, which, when exchanging data between different actors, records and authenticates all relevant information and transactions. The encryption technique, which concatenates each individual data block with the next one indissolubly, ensures that this data cannot be manipulated. This counterfeit security leads to the third useful property of blockchain: it enables and generates trust. Digital business expert Noller, who founded the blockchain startup Ubirch in 2014, shows how this can look in concrete terms. “We have developed a blockchain application that enables the secure and automated collection of IoT data in the industry,” he explains. For example, when a manufacturing facility produces a part, it stores all the manufacturing data for that part in the blockchain. The cryptographic key to this data lies in the sensor of the production machine, so the machine that performs the next production step can automatically access the data and process the component accordingly. This enables the machines to act largely autonomously and to work across the value chain without tedious checking processes. 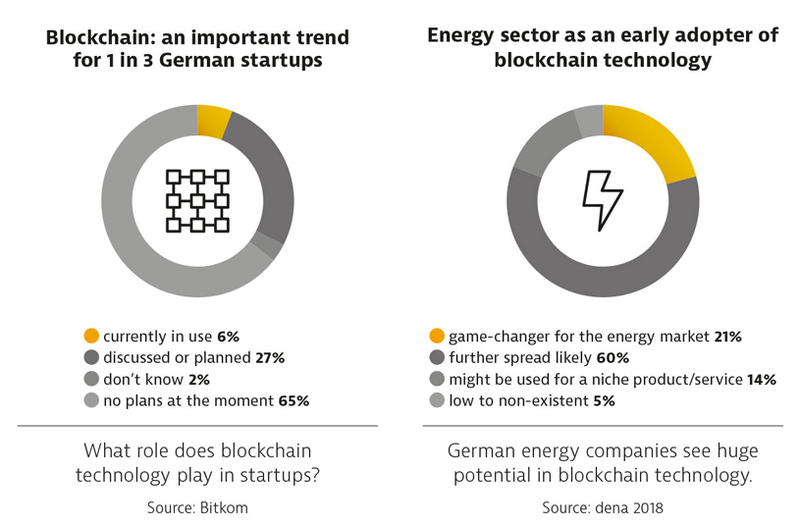 Even investors with a broader focus have been watching developments on the German blockchain scene with interest. Take BlueYard Capital, an investment fund established in Berlin in 2016, for example. 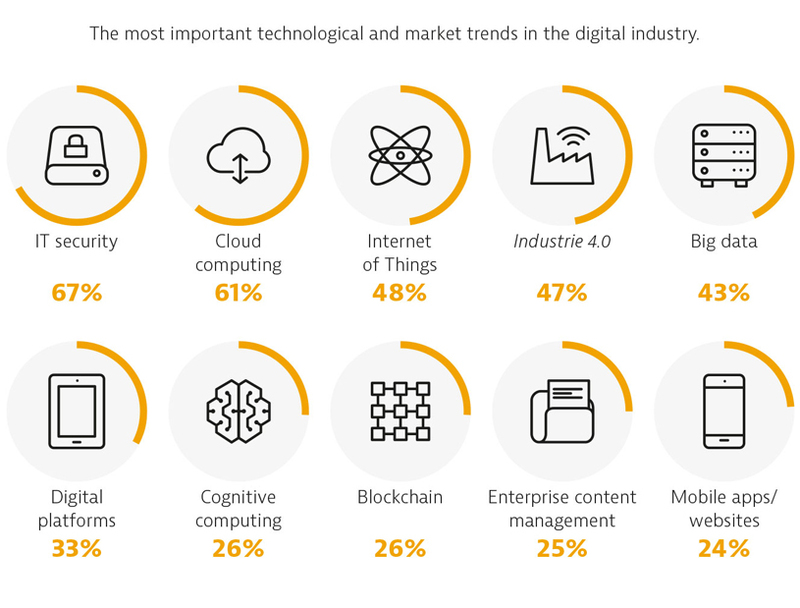 It invests in startups that enable applications of decentralized technology that can fundamentally transform business models in a number of sectors. The fund’s founder Ciarán O’Leary raised €120m from international investors and works with major U.S. funds such as Thrive, UPS, and Sequoia and with venture capitalists such as Union Square Ventures. The blockchain community in Berlin is also attracting investment from Asia: the startup Xain collected €6m in seed financing this summer from Asian Business Angels, among others. Xain are developing a version of blockchain operating system for cars in collaboration with Porsche. But despite a handful of specialized funds, blockchain remains unfamiliar territory for many investors and companies and they should be aware of certain considerations when investing in startups. For example, many of the companies use so-called Initial Coin Offerings (ICOs) to finance their ideas and business models. In the process, quasi-digital securities are raised: the company generates “digital tokens” (comparable to value coupons) and subsequently sells them. Since ICOs are still largely unregulated, this crypto-crowdfunding is controversial and considered a highly risky investment. Several fraud cases have recently come to light, in which hopeful investors were strung along. Despite the risks, a lot of money continues to flow through ICOs. Last summer, bona fide Hong Kong-based startup Block.One collected more than $4bn. The company, which is part-owned by the German entrepreneur Christian Angermayer, aims to build the largest global platform for blockchain ­developers. The blockchain scene is rapidly evolving to keep up with the heightened level of interest in the sector, and political support for the movement is growing. 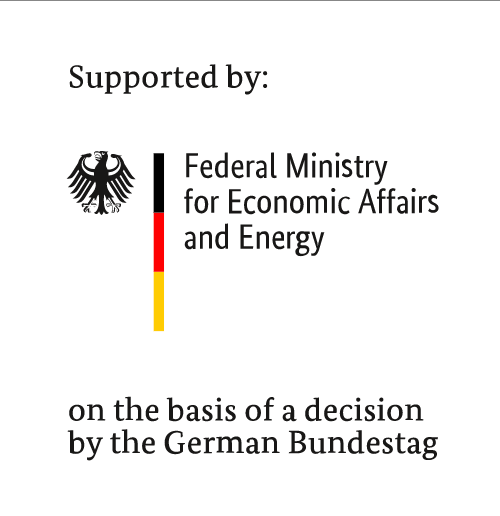 Within a relatively short time, Berlin’s tech community has created good framework conditions for their projects to grow, and is in the process of solving the technical and regulatory challenges of distributed ledger technology. 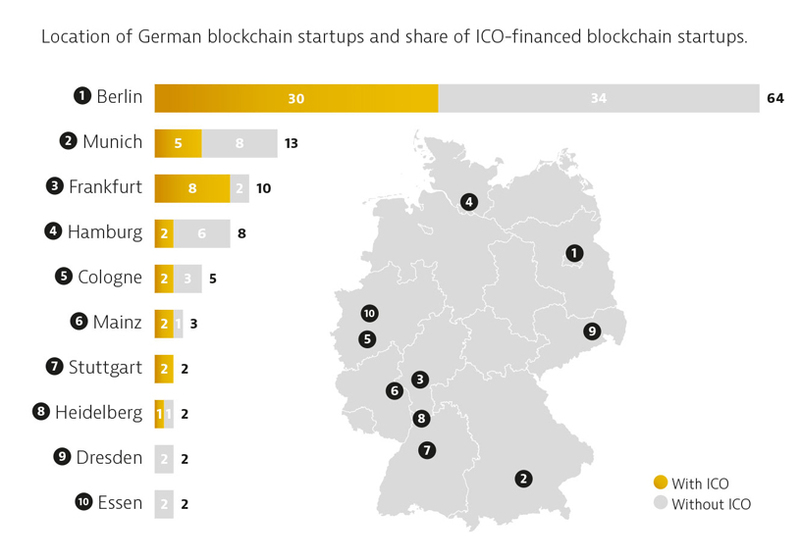 As a result, Germany has become one of the most dynamic blockchain locations in the world, offering a plethora of exciting opportunities for investors willing to take the plunge.